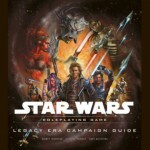 My review of the Star Wars: Legacy Era Campaign Guide is up at GameCryer.com. As I mentioned in the review, the Legacy Era is a real hodgepodge of Star Wars tropes, species, technology and heroes. I was skeptical about it at first — did we need yet another Sith Empire? Did the Jedi need to be extinguished again? But as I’ve read through the graphic novels and reviewed this campaign guide, I came to the conclusion that the answer is a “yes”. Legacy is a great time period for a sandbox-style game where you want to be able to draw on an entire galaxy’s worth of stuff. It’s perfect for those who find themselves unable to commit to any one era when running a game, as well as those who don’t want to muck about with continuity. Check out the review or buy the book on Amazon.com. 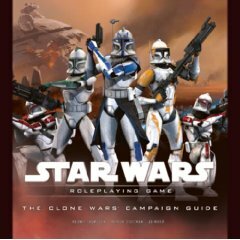 My review of The Clone Wars Campaign Guide for Star Wars: Saga Edition is up on GameCryer.com. What I liked best about The Clone Wars Campaign Guide are its combat options, specifically its new squad, mass combat and follower subsystems. As I mention in the review, The Clone Wars mass combat system is the first d20 rule set that I felt really worked at the character and army level. We’ve tried a bunch of options, from D&D 2nd Edition’s Battle System to Malhavoc’s Cry Havoc to a home-brew mass combat system, and none of them did a good job of really integrating heroes into combat. This did. My review of the Knights of the Old Republic Campaign Guide is up on Nuketown. As you might imagine, this is an important book for our KOTOR campaign; we could have run the game without it, but it would have been a lot harder. The single best aspect of the book is its comprehensive history of the time peroid; there’s a lot there scattered through a dozen comic books and two video games, so its very useful to have a single campaign guide that pulls everything together. Shadows of the Force is a Knights of the Old Republic campaign set just before the Mandalorian Wars. It's powered by the Star Wars: Saga Edition rules. Learn more. The Holocron of Zend is the companion wiki to Shadows of the Force. Go there for write-ups on PCs, NPCS, starships, locations, and much more.